Quick and easy dispute resolutions. Now just a click away. A better customer experience begins here. When customers submit claims they don’t expect perfection, they expect preparedness. Esker helps companies deliver an improved customer experience by enabling CSRs to log, track, manage and prioritize all claims in the same interface as their orders — bringing newfound clarity to issue management workflows. And, with issue-related data available at the click of a button, CSRs always make fact-based decisions which promote continuous improvement and financial savings associated with customer issue management. track & analyze customer issues electronically. customer claims in the same interface as orders. more positive, proactive business interactions. & address your recurring customer issues. Transform your CSRs into proactive problem-solvers. With no new issue management software or interfaces to learn, Esker makes claim management easy. Customer issues are visible on the same dashboard that your CSRs use on a daily basis, so a single click is all that’s required to tackle claims head-on and avoid any issues "slipping through the cracks." When you see everything, you can handle anything. Customize workflow and collaborate freely. Companies using Esker have the added benefit of defining approval workflows for different situations and configuring them to meet their specific needs. For example, product defects and invoice issues will not be resolved by the same people and with the same procedures. 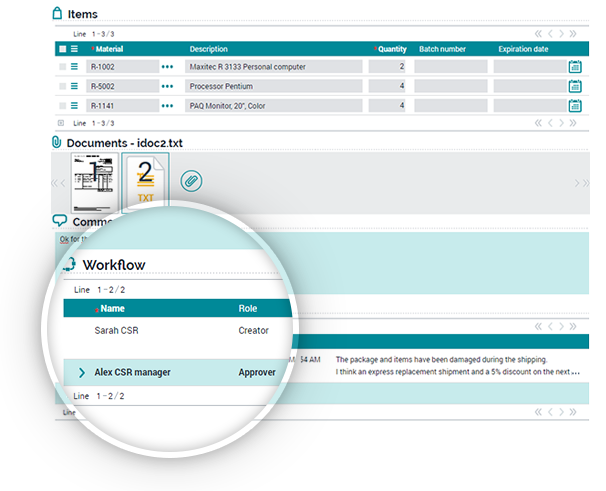 Users can also collaborate with other departments and external partners directly from the application, forward an issue, fax or email it to a partner, attach complementary documents, and keep track of the workflow and audit trail. Create an empowering and professionally satisfying environment for your team. When customer issue management is under control, your CSRs are less stressed and more productive to the business as a whole. This isn't just good for customer experience — the analytical nature of Esker's solution means CSRs have more accountability and opportunities for upward growth. And when employees are fulfilled professionally, your business will be fulfilled financially. Think your issue management process could use a boost? Contact Esker today to get the ball rolling in the right direction.